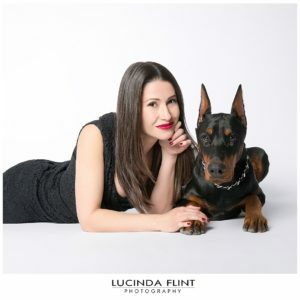 Lucinda Flint Photography, a local photographer, is known for her stylish pet photography. With her work displayed around town in local vet offices and boutiques, you can’t miss the captivating shots of Lucinda Flint. We walked into her Northwest Las Vegas valley studio and saw the perfect setting for her creativity to come to play. Whatever your vision may be, there is no doubt that Lucinda can help execute it flawlessly. 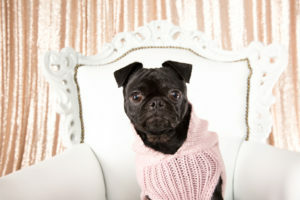 Lucinda specializes in pet photos and they are super cute! If you have a cuddly one, you should consider taking photos with them. Family pets deserve a spot on the wall, don’t you think? Lucinda also masters maternity and senior photo shoots. She can make anyone comfortable with her personality and charm. With Lucinda a session is just like spending the day with a good girlfriend, who happens to be amazing behind the camera. The artistic images she takes will help create memorable photos for you and your family to hold forever. Lucinda is passionate about her work and she will be sure to light the perfect moment. We were fortunate to have Lucinda as our sponsor photographer for the 5th annual style with a cause and would like to thank her and her team for such a wonderful job! She and her team gave so much time and effort to capture our event and make everyone shine. Women Empowering Women… her photographs exemplify our motto. Thank you Lucinda!